1864 Envelope from London to Exhall showing a very fine boxed MISSENT/TO/WARWICK. 1805 Entire to Rochdale showing a very fine COVENTRY/91 MILEAGE, '91' IN BOX 6 x 10 mm, WA 99. Scarce. 1805 Entire to Rochdale showing on the front, a very fine COVENTRY/91 MILEAGE, 91 BOX 6 x 10 mm, WA 99. SCARCE - ONLY RECORDED USED IN 1805. 1847 1d Red-Brown, SG 8, lettered A-A. A four-margin example tied to envelope to Henley-in-Arden by a Birmingham '75' numeral cancellation showing, on the front, a Hockly/Penny Post in black. 1847 Entire to Henley-in-Arden with, on the front, a Hockley Penny Post in black. 1846 and 1850 Covers showing both SERIF and NON-SERIF straight line 'OLDBURY'. 1794 Entire from Birmingham to Atherstone redirected to London showing a fine two-line ATHER/STONE. An interesting letter regarding the sale of the contents of ASTON HALL giving valuations for furniture, paintings, china etc. Interesting! 1826 Entire to Edinburgh showing on the reverse a superb LEAMINGTON 'FLEURON', WA 203. 1844 Envelope to Birmingham with, on the reverse, a very fine HOCKLEY/PENNY POST, BM 288. 1840 1d Red-Brown, SG 8, tied to mourning envelope Henley in arden by a BIRMINGHAM 75 numeral showing a very fine MOSELEY undated circle in blue alongside. 1841 Entire re "Mr Wm Gardiner of Redditch" addressed to Henly Arden showing a very fine oval-framed PAID AT/A/STRATFORD in black. 1873 1d Rose-Red, SG 43, Plate 161, tied to mourning envelope to Leicester by a fine COVENTRY 223 duplex with a very fine COVENTRY "TOO LATE" alongside, WA 137. 1845 Entire from Birmingham to Cockermouth with, on the front, a fine, distinctive SMETHWICK/PY POST, BM 300. 1849 Envelope to Leamington from Derby showing a very fine ALVASTON undated circle in black. 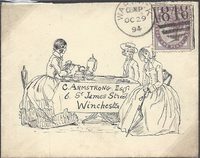 1851 ARCHER 1d Red-Brown PAIR AND SINGLE from PLATE 100, A-J, B-K, B-L, tied to envelope from London to Warwick. A Rare Mulitple Franking of the Archer 1d Red-Brown. Possibly Unique. BPA Certificate. 1835 "MONEY LETTER" PRE-PAID FROM BIRMINGHAM TO LONDON, 110 miles - normal rate 9d but with 2 enclosures (Bills) charged triple '2/3d'. 1843 Entire from Leicester to Dublin showing very fine MISSENT TO BIRMINGHAM, BM 173. 1839 Entire from BIRMINGHAM to LONDON which was OVERCHARGED and taken back to the Post Office for a REBATE. Showing on the front an oval 'REBATE/crown/date/INLAND OFFICE' in red, L298. RARE.